Note: this page is still in progress. I’m trying to add one post per day and this page will combine those posts. , by Blake Harris, made me realize just how much I wasn’t aware of things when I was a kid. It’s pretty Sega-centric — Harris’s main source is Tom Kalinske, former CEO of Sega. The book talks a lot about everything going on in the industry but doesn’t get too deep into the games themselves. It’s mostly about the marketing around the games. My parents owned a house in Washington. We’d visit the US every summer break. That was about my only exposure to American commercials. (Sometimes my uncle would send over VHS recordings of American cartoons.) Side note: living on base we’d get Japanese channels and a handful of english channels but the english channels had commercials about the different military branches instead of products. It’s over 550 pages — sometimes I don’t realize how long books are since I mostly read on Kindle. I enjoyed it and thought I’d share 5 things I thought were interesting. These aren’t exactly design-related. Or not really design-related at all. I stepped aside and an older kid—picture young John Connor—took the joystick. A few moments later Sub-Zero ripped someone’s head off with their spine attached. Awesome. This was my first time seeing a fatality in Mortal Kombat. Apparently some parents didn’t think this was great, so the first Mortal Kombat had sweat instead of blood. Except for the kids with a Genesis. I made the last quote up. My point was going to be that the SNES had watered down fatalities. But… this seems pretty brutal too. But these seemed much tamer as a kid. I remember being really aware of how the first game had sweat. Nobody was buying the SNES version and most of my friends were Nintendo kids. And that it was a big deal that the sequel would have blood without a code. Anyway we got it and then played it. A lot. I remember seeing MKII the first time at an arcade in an airport. And someone (again, an older kid) had what looked like a strategy guide but it was just a bunch of printouts. And these printouts had all the moves and fatalities. That might have been my first exposure to anything related to the internet. Console Wars talks about the different approaches toward violence that SEGA and Nintendo took. Oshima partnered up with Yuji Naka, a brilliant hothead in the programming department who was responsible for one of Sega’s most popular series: Phantasy Star, a sci-fi role-playing game (RPG) about a resilient young female warrior bent on galactic revenge with the help of a muskrat named Myau and a wizard named Noah. Side note: I thought Zelda was generally considered an RPG. According to my research (clicking a few links on a Google search), most people don’t consider it an RPG. And get pretty passionate about it not being an RPG. Anyway, I guess that further helps the case that Console Wars has one single mention of an RPG. RPGs make up 6 of the top 20 best selling SNES games. I grew up in Japan on a U.S. Navy base. Which means it’s not really like growing up in Japan and not really like growing up in America, either. Families would go off-base at night or on weekends. And you’d also live off-base while you were on a waiting list for on-base housing. On these weekend trips out, my and I would wander around the videogame section of a department store (Daikuma or Da’e) while our parents got groceries. On one of these trips, we noticed people gathered around a spinning wheel and walked over. After watching a few times, it looked like you paid 2000 yen, spun the wheel, and got to pick from either 1, 2, or 3-game packages. Anyway, our mom let us spin and we got the 2-game choice. We picked the package with Super Smash TV and… some game with a bird on the cover. My brother had heard of the game but we were mostly in it for Smash TV. The other game was Final Fantasy V. I was extremely bored any time I watched my brother play it. Then one day I tried it out and it didn’t make sense at all. Literally. It was in Japanese, after all. I started out wandering aimlessly. Then I continued wandering around aimlessly. For dozens of hours. And just memorized the menu location for some useful potions (mostly just elixir and HP recoveries). A main character blinks away, teleporting somewhere. Some girl joins the party for unknown reasons. Then I realize the guy teleported to heaven because guess what actually he died. Dozens of hours turned to dozens and dozens of hours. Memorizing the +100HP potion became memorizing the +1000HP potion. Then I beat it. I still have basically no idea what the story is about. So, you know, don’t make your UX like that. Prior to reading Console Wars, I had some perspective on video games in Japan. Actually, it’s a little unusual. My dad was in the Navy and I grew up on military bases in Japan in the 90s. I played console demos in Japanese department stores and spent plenty of time in Japanese arcades basically run by Sega. But our family and all my friends had American consoles. And we had english TV channels, but they had weird mixes of syndicated shows. The oddest part was that instead of commercials for products, there would be commercials about military life and American history. So most of the American marketing I experienced was through video game magazines. “But why?” Arakawa asked Tilden, looking at the April 1993 issue of GamePro magazine. 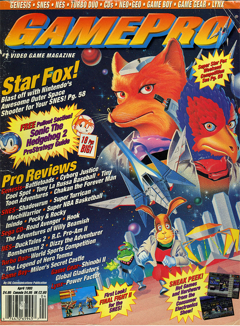 On the cover, right there in front of them, was artwork from Nintendo’s Star Fox. Not only had this artwork been intended for Nintendo Power, but White had specifically met with Arakawa, Tilden, and Harman to discuss sharing it with outside magazines and had explicitly been told not to do so. As long as I remember, our parents let us subscribe to at least one video gamemagazine. And any time we went to the book store I’d first look at Goosebumps for the newest release then read the game magazines. Game Players magazine had a newsletter that, looking back, seems like weird internet before the internet became what it is today. Something I remember is one issue where a reader wrote inn asking how the magazine makes the stitched together maps. And they said it was software that costs hundred and hundreds of dollars. I remember picturing some kind of mega-expensive super computer. Where like they’d make the brontosaurus in Jurassic Park and then in another window they’d have Link to the Past maps. Now I realize it was probably Photoshop. Game Players turned to Ultra Game Players then disappeared altogether. Then we switched to an EGM subscription. 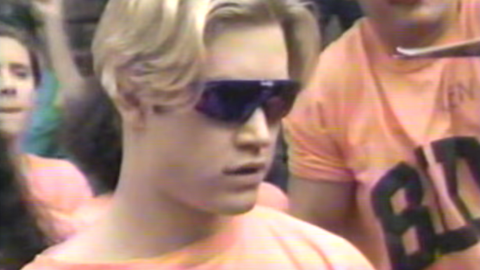 GamePro (of PROTIP fame) skewed younger. We had some of those but they were usually one off purchases from the book store. 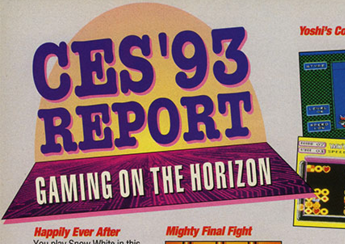 Nintendo’s side project was publishing a magazine with more than a million subscribers. As far as I remember, the book store didn’t have Nintendo Power. So the only kids that had copies had subscriptions. I remember the Star Fox cover but really had no idea it was a big deal. I was probably in 2nd grade or 3rd grade so I didn’t understand that anything was a big deal. I really had no idea that Nintendo Power was a giant monthly advertisement. Again, the best parts of Console Wars are the behind-the-scenes looks at Sega’s marketing strategies. The Super Nintendo had Mode 7, which made games like Star Fox and Mario Kart possible. Now that I’m doing some image searches, I’m learning it was also used in other games for certain sequences, like every overworld map. I like imagining a .ppt from Nintendo with a slide titled “Guidelines: fitting races into stories” with 7 bullet points underneath. While looking through the manual, Latham found something that kind of, sort of, maybe fit the bill: Burst Mode, which in theory allowed the Genesis to process code faster than Nintendo’s chip could. Although this sounded like exactly what the marketing team wanted, Latham explained that Burst Mode actually had very little to do with the graphics, velocity, and overall performance of Sega’s games. To say that Burst Mode was the reason that Sonic could move so fast would be like saying that cheetahs were faster than elephants were because of their spots. Burst Mode turned into Blast Processing. The book ends in the very early stages of the 32-bit era. 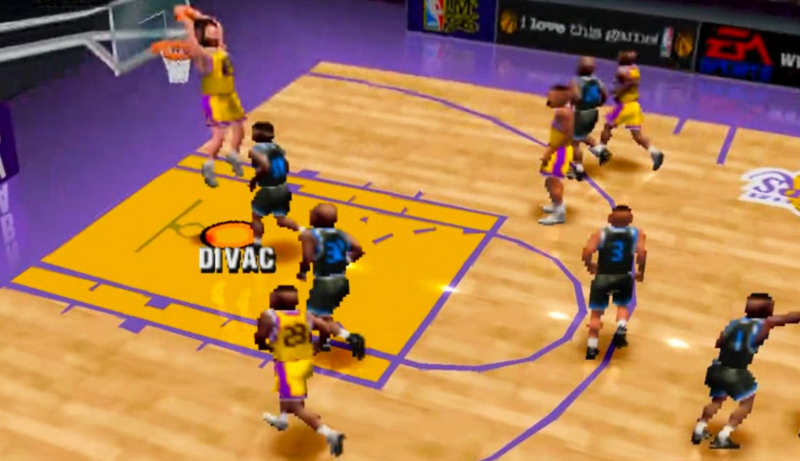 When our family got a Playstation, one of the first giant-jeweled-case games we got was NBA Live 96. I remember thinking my dad would think this purchase was totally worth it if he saw the graphics. So one day I told him close your eyes okay now open them. Console Wars does a great job capturing Sega’s willingness to try new ideas. And a lot of the ideas involve celebrities. A practice session may seem trivial, but it was important to Sega that these young celebrities give the impression that they really did love videogames and weren’t just heartthrobs for hire. Wouldn’t ever want to make them look foolish.